An hour ago I felt forced to turn off my computer and violently stop my connection to a Greek radio station through the internet frustrated from what I had been listening the last hour. It was a daily evening radio show that opens the telephone lines to the audience giving them the chance to speak freely and express opinions and ideas. The woman who made me turn off my computer introduced herself as an economist in her mid forties who works for the civil services sector and she emphasized that what she’s going to say represents most of her colleagues since they are talking about these issues often. She actually mentioned that that moment she was in her house with four of her colleagues and their partners. I must point here that she sounded an educated and certainly sophisticated person who used very well the language and the chance to talk with a wider audience. The woman said that the [Greek] nation is in danger surrounded by communists, liberals, anarchists, immigrants, gays, Muslims and corrupted politicians and that the only solution was a vote to Golden Dawn. She said that she was aware that the Golden Dawn is a neo-Nazi party and that they are inspired form Adolph Hitler and while acknowledging that Hitler was a criminal responsible for inhuman crimes and his ideology an embarrassment for the human race the same time she emphasized that when the times and the responsibilities come the Golden Down will leave all these behind and they will focus into saving the nation [Greece], from the communists, the liberals, the gays, the immigrants and the corrupted politicians. I think the radio producer was as shocked as I was because he didn’t even thought to interrupt her, and she continued with her non stop little speech. After pointing that the 15% the last published survey has given to the Golden Dawn and that all the world would be soon surprised when golden Dawn will be majority and the ruling force in Greece she came to the event that had made head lines the very same morning saying that the Golden Dawn is full of kids and sometimes kids exaggerate hitting people but this is something that happens and we should just see it as kids games and get to more serious things. After all, as she pointed, they only hit communists and we all know what short of crimes Stalin had done. If I hadn’t seen the results of that survey that does give nearly 15% to the neo-Nazi Golden Dawn bringing them in the third place and had the Finnish experience where everybody ignored a similar survey a month before the Finnish elections that brought the fascist and racist True Finns from something over 3% to the unbelievable 19.3%; and if I hadn’t seen with my own eyes the period I stayed in Greece in the beginning of the year the neo-Nazi troops threatening and bulling citizens in the centre of Athens I might had laughed with the woman. I would have wonder if she under the influence of something and most likely forgotten about her with the next speaker. But it was not like that. First things first. What had happened in the early hours of the same morning was the kids’ play the women had made the reference is just the peak of the events unveiling the last year in Greece. In the preparation of the annual festival of the youth of the Greek Communist Party (GKP) a group of twenty (20) members of the youth of the GCP went to put posters in central places in an area near the port of Piraeus. Suddenly and while walking they found themselves surrounded from two directions from groups of men wearing black cloths with the logos of the neo-Nazi organization, wearing masks and helmets and carrying iron bars, iron pries, wooden clubs and wooden beams. As a result of this ambush eight people had to be carried to hospitals with major wounds while others suffered minor injuries. The same time and under the obvious influence of their macho substances and not be able to send every single person to the hospital the “kids” decided to destroy other people’s belongings destroying cars parked in the area. According to witnesses that except the victims include neighbours of the houses a lot of the black dressed men were recognized especially the local leadership of the Golden Dawn Pantazis and Kastrinos. Both known criminal parasites. But while faces were recognized and names were given twenty hours later nobody has been arrested. Coincidently another event took place a couple of days ago in Salonika this time. Showing the opposition to the involvement of an internal issue (that unfortunately involved the stupidness of an Albanian football player who plays for a football team in Salonica) Golden Dawn tried to get involved in a hunting for votes patronizing the fans and the responsible of the team. The fans reacted demonstrated in front the Salonica offices of the Golden Dawn peacefully. As a result 25 of them were arrested immediately and led to a court with the accusation of unsettling public order! Comparing these two events - and there tens more the last few months where Golden Dawn members do unbelievable crimes and they manage to escape arrest while demonstrators against the Golden Dawn can be arrested even in their houses a few hours after the demonstration with them most provocative accusations – you don’t need to be Sherlock Holms to come to the conclusion that there is something seriously wrong with the Greece police and the judicial system. When the dictatorship fell in July 1974 the first thing the democratic Prime minister who had just arrived from the exile was the purification of the system. Mr. K. Karamanlis (and all the Greeks at the time) knew that the dictatorship drafted power form the army – for generations brainwashed nationalists with past in coups – the security forces and the judicial system. The army, perhaps feeling the guilt and responsibility of a dictatorship responsible for repulsive crimes, murders, rapes and exiles started purification from inside and probably forty years after there is still only a small number of the ones who miss the dictatorship. To that helped the privilege confront from the state with high salaries and extra privileges like house loans with zero nearly zero interest in special chosen areas. For the security forces I’m afraid nothing changed. While in most states the necessary merits to qualify them for the forces is height, weight, experiences, intelligence in Greece for forty years the main merit to qualify them has been their ideological background and the darker it was closer to black the better. In the last national elections when the Golden Dawn shocked everybody by jumping from the nearly nothing % to 7% in electoral stations near police station and especially in ones where mainly policemen were the voters got up to 95% . If there are good and honest policemen? Of course there are, they are the exception that proves the rule and the rule is a common knowledge for over a century in Greece, to be policeman you must be a fascist. The situation in the judicial system is even worst. The judicial system is a closed club where they decide who can be a member and how far he can go without any involvement or control from the state or the parliament. Most of the time a life seat is given to a son or a daughter carrying the same ideas and the same attitude towards the law. Most of them having served as members of court martial during the dictatorship convicting people to prison and exile with their death as a result only because of their believes and their opposition to the dictatorship doesn’t matter if they were communists, liberals or conservatives. For them been a democrat was a crime. These are the people and their kids who rule the judicial system today in Greece. A corrupted and rotten system that sponsors monsters like the Golden Dawn. Again, there are exceptions. Unfortunately they are just exceptions. Greece is in real trouble and whilst the European partners doing their accounting trying to take more money from the Greek pensioners and workers Nazism thrives and the banks might get their money so we won’t have a Euro-domino and endanger German exports but if democracy dies in Greece the domino effect will kill people, thousands of people. Greece lives moments of Germany in 1934 and 1936 when black-dressed men with helmets and carrying iron bars, iron pries, wooden clubs and wooden beams were spreading the ideology of Hitler in Berlin and other German cities. And just like in 1934 and 1936 democracy is very alone. 48 hours after the incident there has been NO ARREST and the government of Antonis Samaras including the minister responsible for the police or the communiscations responsible of the goverment (usually he has something to say about everything) has made absolutely ΝΟ comment, even to condemn the acts of violence. For long there is a suspicion that the Greek government and the Greek Prime minister Antonis Samaras don’t approve the political power the neo-Nazis have earn but the same time they feel comfortable with the job the Golden Dawn is doing in the streets showing a certain level of cooperation. Actually and while everybody was expecting the Prime Minister Antonis Samaras to say something the “democrat” Greek PM said that he’s going to mediate to a conflict between two football presidents with suspicious interests and criminal past. Coincidentally both funders of Samaras party and his personal campaigns. Both to my opinion remind a lot Russian oligarchs and their mafia attitudes, both making their money during the crisis and both investing in popular Greek teams knowing that this gives them political access. 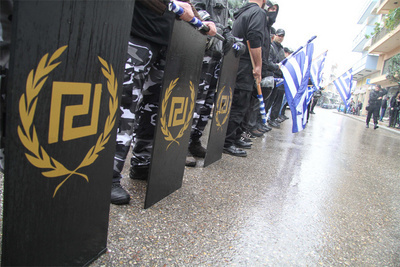 The Golden Dawn with a public announcement to the media said that this was a provocation of people (perhaps communist) who “used” the organization’s clothing and logo but without mentioning that witnesses saw leading members of the organization in the group of the criminals. And that this incident is not the first with helmets and masks to cover their faces or not. 60 hours later the police ...thinks that they can identify 6 of the Golden Dawn members with the testimonies they got from witnesses but they cannot be ...sure yet to make any arrest.